So Which Welterweight Champ Has It “Easiest” In His Next Fight: Spence Or Crawford? It’s all but official: Terence Crawford will likely (Bob Arum says the fight is not signed quite yet) face Amir Khan in his next fight, on April 20, and Errol Spence will face Mikey Garcia on March 16th. But which welterweight champ has it “easiest” in his next fight – WBO champ Crawford or IBF ruler Spence? Both undefeated champions will no doubt enter the ring as big betting favourites, fan favourites to win and the experts’ favourites. Khan, of course, has that unreliable chin, one his critics point to each and every time the Bolton man fights; or at least they have pointed to Khan’s biggest weakness since his 2008 loss to Breidis Prescott, if not before. 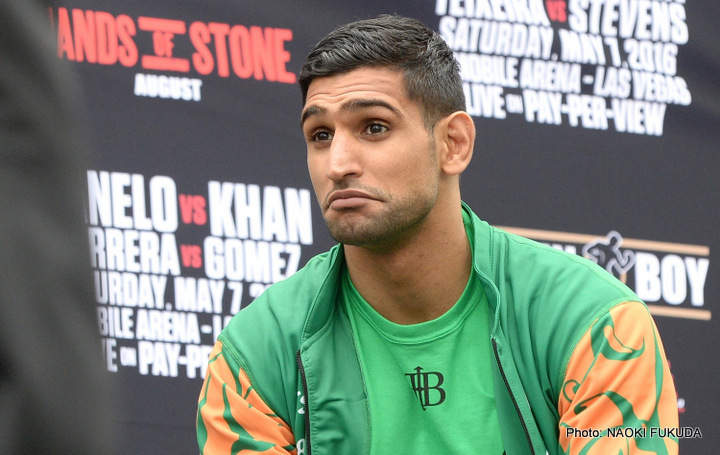 Already, many fans are groaning about the April 20th fight, saying (or shouting) how Khan has next to no chance against the quick, clever, accurate and at times spiteful Crawford. But rewind to before the Spence-Garcia fight was made official, to when it was first suggested (by Garcia, who called for it) and fans bellowed with laughter. This fight, one that pits a former featherweight with a huge 147 pounder, a peaking 147 pounder at that, is a dangerous joke, these fans screeched when the fight was made official. So has Spence got an easier title defence than Crawford, even though he is in Garcia fighting an unbeaten challenger who is a pound-for-pound entrant himself? Both fights are not without intrigue yet it would be a big shock if either Spence or Crawford lost; X2 if both champs lost. Khan figures to stick around for a while against Crawford as he sticks and moves, lets his ultra-fast hands go and sticks to the game-plan without getting tagged, most likely by a counter. While Garcia, with his skills, his own speed and his sheer self belief and toughness, figures to test Spence in the early going of the March fight. But are both challengers headed, at some point; arguably an inevitable point in the fight, for a fall? It seems so. Credit goes to Khan and Garcia for daring, as the saying goes, ‘to be great.’ But it really does seem as though there are only two winners: two 147 champs we want to see fight each other. You are here: Home / Boxing News / So Which Welterweight Champ Has It “Easiest” In His Next Fight: Spence Or Crawford?